This error might have occur because of a sign-in problem. The first thing to do is to go to Settings > Accounts, then remove the Google account that you signed in with before that is getting the Google Play authentication Required message. After that, re-add the account. This issue could be because things are not syncing properly from your phone. Head-up to Settings > Accounts > Google, then tap on your email address, and then press Sync All. You can go back to the Play Store after that to see if the error message as disappeared. If it isn’t, continue reading! To do this, go to Settings > Applications, then locate the Google Play Store app. tap on it, then select Clear Data. This should work, than the previous steps, if it did not, Continue reading! Open your mobile web browser and visit the Play Store website from it. 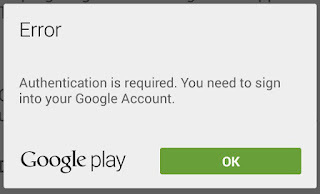 then try to download an app directly, rather than using the Play Store app. Sometimes, the problem might not be from the sign-in attempts. It might just be that the Play Store app is malfunctioning. To resolve this, tap on Settings > Applications, then select Play Store. After that, tap on Uninstall Updates, which will roll back the app to its factory version. Now, install the latest version of the Google Play Store and sign in again. If the Google Play Authentication Required error message doesn't disappear after going through all the above steps, you might have to do a factory reset on your phone. When everybody is making additions and tidying up their features to maintain their relevancy in a fiercely competitive environment, Microsoft is not left out of the innovative mix. Microsoft is spicing things up with its innovative Mixer mobile app. This feature enables the user to stream mobile gamers on both its Android and iOS platforms. These android apps will allow you stream mobile games just in the same way you can do with Youtube. The iOS counterpart will allow you stream games on your iPhone by means of Apple’s ReplayKit. The implication in this case would be that not all games would be supported on iOS but a good part of famous iOS games like Goat Simulator, Modern Combat 5, Star Trek Timelines will align with this new feature from Microsoft. With this new app, you can also enjoy such that you don’t combine with streamers from Xbox and PC. The Mixer Create app is now available in the App Store and Google Play Store.